Leon Mertz, co-button house chair, Minster Mayor Dennis Kitzmiller, and Paul Enneking, board president, display the button for the Minster Oktoberfest.The button was designed by Garrett Hogenkamp, a 2014 graduate of Minster High School. A closeup of the 2018 Minster Oktoberfest button, designed by Garrett Hogenkamp, a 2014 graduate of Minster High School. MINSTER — The grand marshal for the annual Minster Oktoberfest parade was announced Wednesday night. The Button Haus Committee also unveiled the button for the festival Tuesday night. The Rev. 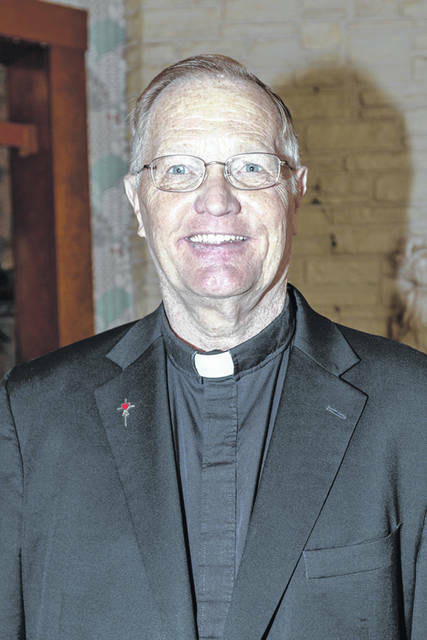 Rick Nieberding, pastor of St. Augustine Church in Minster, has been named the grand marshal for the 44th annual parade. He has been pastor at the church for 12 years and before that served as assosicate pastor for almost eight years. “Father Rick is a very deserving individual and has well exceeded the requirements to be our grand marshal,” said Parade Chairperson Alex Monnier. Nieberding’s commitment to the youth has been a true blessing to this community, said Monnier. Nieberding was involved in the pX Games, Pumpkins for Life and weekly bike trips to McDonalds during the summer as an incentive for those kids who went to church on Wednesday morning. Nieberding, who was not from the Minster community, easily adjusted when he arrived back in 1985 and knew that this is the area he wanted to minister to, said Monnier. The winning Oktoberfest button design was submitted by Garrett Hogenkamp, son of Scott and Shelly Hogenkamp, of Minster. He is an Eagle Scout with Minster Boy Scout Troop 44 and a 2014 graduate of Minster High School. Hogenkamp attended Bradford College and completed his associate degree in 2016. He is working as a freelance designer. He is married to the former Rachel Cull, daughter of Brad and Julie Cull, of Minster. They currently live in Indianapolis, Indiana, where she is studying law. Hogenkamp has two brothers and one sister. Presale of Oktobergest hat pins and buttons is scheduled to begin on Sept. 3 at Jenni’s Hallmark, Stallo Library and Donauer Barber Shop. Oktoberfest buttons only will be sold at Bud’s Pizza and Dutch Mill. The Button Haus Committee extends its gratitude to everyone who submitted a button design. Carol Detwiler and Laura Roetgerman designed the hat pin and chicken pin. A limited number of lapel pins will be sold during Oktoberfest. The Minster Oktoberfest is Oct. 5-7 this year and the parade is Sunday, Oct. 7, beginning at 2 p.m.
https://www.sidneydailynews.com/wp-content/uploads/sites/47/2018/08/web1_button-men.jpgLeon Mertz, co-button house chair, Minster Mayor Dennis Kitzmiller, and Paul Enneking, board president, display the button for the Minster Oktoberfest.The button was designed by Garrett Hogenkamp, a 2014 graduate of Minster High School. https://www.sidneydailynews.com/wp-content/uploads/sites/47/2018/08/web1_button.jpgA closeup of the 2018 Minster Oktoberfest button, designed by Garrett Hogenkamp, a 2014 graduate of Minster High School.